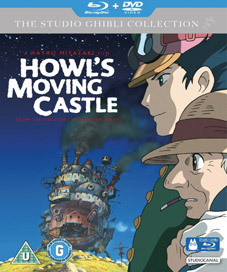 StudioCanal continue their quest to make the entire Studio Ghibli catalogue available on Blu-ray and DVD in double-play sets with the release later this month of Hayao Miyazaki's marvellous 2004 Howl's Moving Castle (Hauru no ugoku shiro) and his son Goro Miyazaki's debut feature, the 2006 Tales From Earthsea (Gedo senki). Howl's Moving Castle is set in a magical world of wizard and spells and follows the adventures of Sophie, a young girl trapped in an old-woman's body by an evil sorceror's spell. Based on the popular book by British author Diana Wynne Jones, the film was another international hit for Japanese maestro Hayao Miyazaki, following his widely acclaimed success with Princess Mononoke (Mononoke-hime) and Spirited Away (Sen to Chihiro no kamikakushi). A big UK and US theatrical hit (albeit in the dubbed version), Howl's Moving Castlewas one of the biggest film openings ever in Japan. The directorial debut of Goro Miyazaki, son of the legendary Hayao Miyazaki. 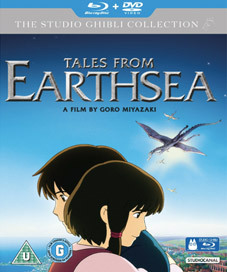 Tales From Earthsea is based on the unique series of books by Ursula Le Guin, an enchanting story that takes place in a fantasy world of dragons and wizards. A ship is tossed by a raging sea and two dragons appear from the storm clouds, only to devour each other. This is seen to be a terrible omen that the very balance of the world is collapsing and sets Sparrowhawk (Timothy Dalton), a wizard, on his quest to find the source of the evil forces that are shaking the world. Both films will be released on UK dual-play (Blu-ray and DVD) by StudioCanal on 25th June 2012 at the RRP of £24.99 each.